World Fishing Journal attended the Kingston Canadian Open in Kingston, Ontario to film the action (it was awesome!) and to get the story behind Shimano's Water Weigh-In System. The system effectively extends the benefits of the livewell environment to the weigh-in scale, which helps to reduce stress and mortality in the catch. Prepare to toss your plastic bags, tournament organizers. This segment represents something of a homecoming for this particular piece of fishing technology: Queen's University, located in Kingston, and Shimano initially partnered in a study to measure and determine the impact of live-release tournaments on fish.Shimano produced this handy brochure about the science behind the system. 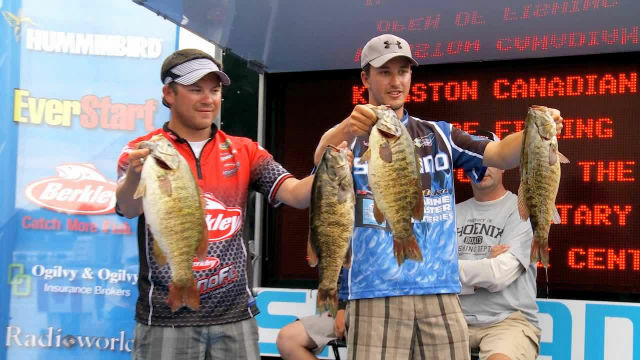 Looking for more from the Kingston Canadian Open? Check out the first, second and third place winners, the non-boater winner, and WFN's contest winner (you'll be amazed by how well he did! ).